The Oilholic attended the British lobby group CBI’s annual conference earlier today listening to UK Prime Minister David Cameron flag-up his crude credentials (admittedly among other matters). The PM feels investment in the Oil & Gas sector and British expertise in it could be part of his wider economic rebalancing act. “In last few weeks alone I have visited an £4.5 billion new investment from BP in the North Sea…And today I hosted Britain and Norway signing a 10-year deal to secure gas supplies and develop together over £1 billion of Norwegian gas fields,” he said. That deal of course was part of British utility Centrica’s 10-year agreement worth £13 billion to buy natural gas from Norway's Statoil and jointly develop fields. "Gas plays a central role in powering our economy, and will continue to do so for decades to come. Today's agreement will help to ensure the continued security and competitiveness of gas supplies to Britain, from a trusted and reliable neighbour," the PM concluded. Admittedly, from a gasoline consumers’ standpoint successive British governments have long lost street cred when it comes to taxing fuel a long while ago; still the present lot fare better in relative terms if the UK ONS is to be relied upon. The British statistics body announced last week that the Government’s Share of petrol pump price dropped to 66p in the pound in 2009/10; from nearly 81p in 2001/02. The data also show that the poorest 20% of UK households paid almost twice as much of their income in duties on fuel than the richest 20%. In 2009/10, the poorest 20% of households paid 3.5% of their disposable income on duty, compared with only 1.8% for the top 20%. Overall, the average UK household spent 2.3% of its disposable income on duties on fuel. However, in cash terms, the richest 20% of households paid almost three-times the amount paid by the bottom 20%. In 2009/10 the richest 20% of households spent £1,062 on petrol taxes, compared with £365 for the poorest 20% of households. Overall, the average UK household spent £677 on duties on fuel in 2009/10. Finally, the UK, US and Canada announced new sanctions against Iran following growing concern over its nuclear programme in wake of the IAEA report. In a statement the US government said that Iran's petrochemical, oil and gas industry (including supply of technical components for Upstream and downstream ops) and its financial sector would be targeted by the sanctions. Canada will ban all exports for the petrochemical, oil and gas industries without exceptions while the British government would demand that all UK credit and financial institutions had to cease trading with Iran's banks from Monday afternoon. The Oilholic notes that this is first time the UK has cut off a petro-exporting country’s banking sector, in fact any country’s banking sector in this fashion. Its highly doubtful if the move will tame misplaced Iranian belligerence. © Gaurav Sharma 2011. 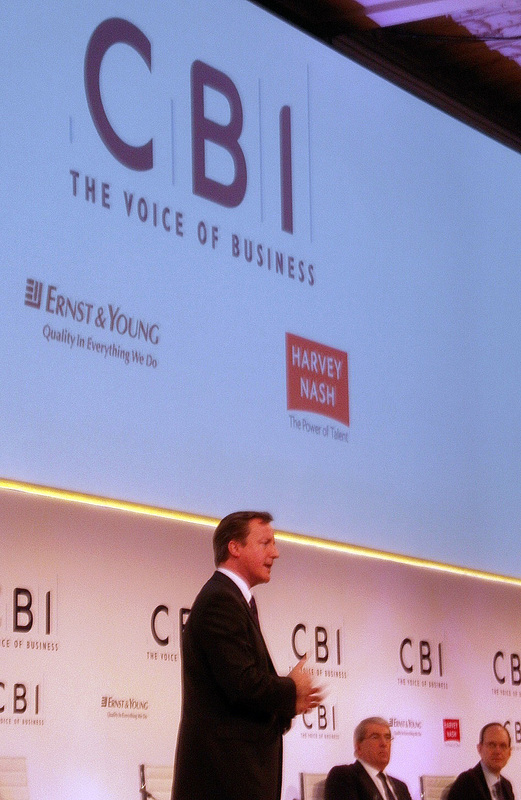 Photo: British Prime Minister David Cameron speaking at the CBI Conference, November 21st, 2011 © Gaurav Sharma 2011.